Finding a good MIDI keyboard controller that has all the features you need on a budget isn’t easy. 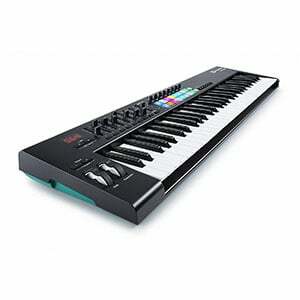 However, Novation’s Launchkey 61 definitely ticks all the boxes and is easily one of the most capable MIDI keyboard controllers on the market today. We just had to take a closer look! When it comes to design, Novation kept things pretty tame with the Launchkey 61. It seems they understand that functionality beats aesthetics in this business. The simple black chassis design won’t win any awards for style, but it leaves plenty of room for features, with a sensible control layout – as crowded as this controller may be, it is still very intuitive. Novation has divided everything into clusters, which makes this controller easy to navigate, even in a chaotic live environment. The build quality is more than decent for the price, with a solid chassis that is fairly durable. So far, compared to other models in this price range, the Launchkey 61 looks like a bargain! As we move onto features, things get more exciting. Naturally, the main focus falls on the keys. As the name suggests, this controller features 61 velocity-sensitive keys of the synth variety. Above these, you will find 16 very vibrant RGB touchpads, which are also velocity sensitive. The secondary cluster of controls consists of nine faders, eight knobs and the standard pitch/modulation wheels. Of course, all of these are fully programmable, making for a versatile experience. This controller was originally designed to work with Ableton Live, however it is compatible with a variety of other DAW software. You can expect full Mac and PC support, while the package comes with a bunch of software (including Ableton Live Lite and Novation Bass Station) that allows you to get started straight from the box. There are no complicated drivers to install – if your device has a USB port, the Launchkey 61 should sync up instantly. Performance-wise, the Launchkey 61 offers a happy medium. The keyboard sensitivity is great in a sense that you are getting that classic synth­like feedback. The keys are fairly light, but take some pressure to trigger and the same goes for the pads. If you use the software that is provided with the controller, you won’t have to do any mapping at all. Some software will require you to map, though that is a very small price to pay for almost guaranteed compatibility. When it comes to increasing workflow, this controller really is a great value. Having just about everything you could possibly need right in front of you makes the world of difference. Like we’ve said before, the control interface is a little crowded, but completely intuitive and easy to get to grips with. All of this makes the Launchkey 61 an awesome choice for both beginners and advanced users. The Novation Launchkey 61 may not be the best looking, nor the most tricked out controller on the market. However, it is undoubtedly one of the most functional models you can buy without severely denting your finances. Its fully programmable nature and great compatibility only add more value to an already great product. For more info about the Novation Launchkey 61, click here.